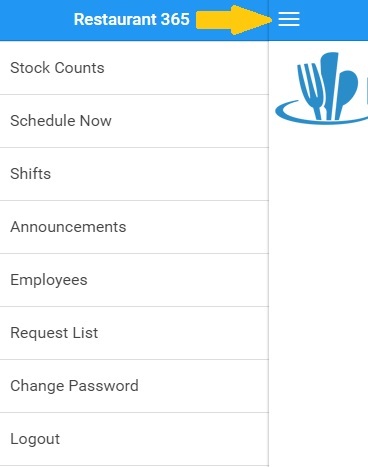 Managers can do many of the scheduling functions from within the mobile app. Download the iOS or Android app from your app store to install on your mobile device. Login to the app for managers uses the same user login and password they use to login to through a web browser. 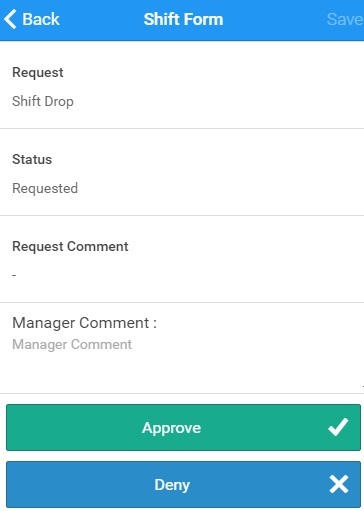 Click the menu button (orange arrow below) to show all the options available to the manager in the app. This is a quick view of who is scheduled to be working right now. 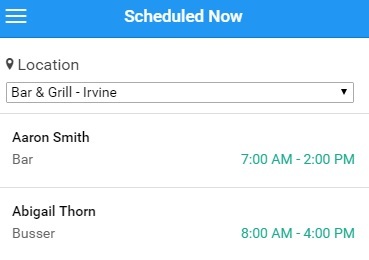 If you wonder who should be working now, you can check this quickly on your phone instead of going back to a computer or the printed schedule. This has 2 tabs for Shifts and Unassigned shifts. This shows upcoming shifts and clicking on a shift will open the details. The manager can update the shift and click Save in the top right corner. 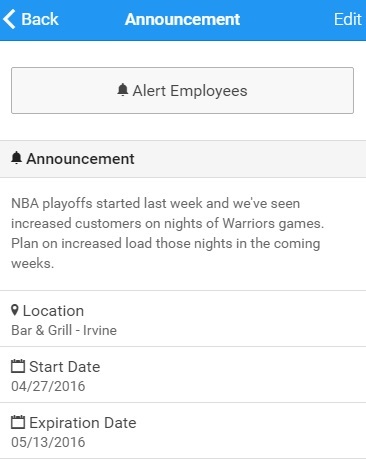 Press the alert button to send a text/email to the employee with their shift details. Clicking this will show the announcements entered that are visible to the employees also. Click on an announcement to edit it. To create a new announcement, click the New button in the top right corner. Once an announcement is open it will look like the image below. The Start and Expiration dates manage when they announcement will show up for employees. Click Alert Employees to send out an alert of the announcement (email or text based on their preferred contact method). Clicking this opens a list of employees where you can select the ones you want the alert to go to. 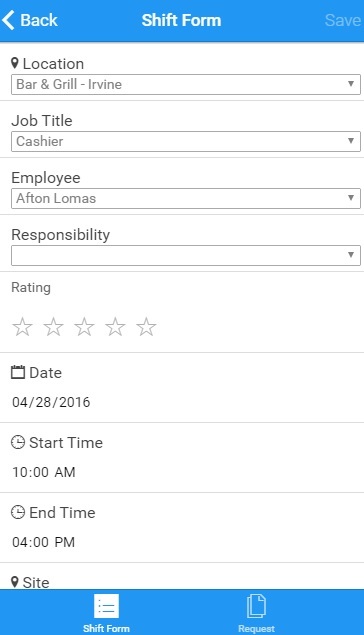 This will display the employee list. Click an employee to quickly send an email or call them using the Email and Call buttons (circled in orange in image below). Employees have 3 tabs of data: Info, Punches, Availability. To edit the employee info, click the Edit button in the top right (orange arrow in image below). 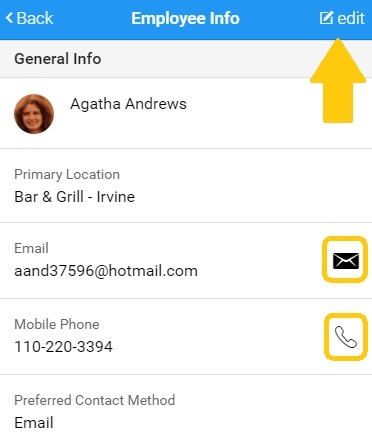 This tab shows employee general info such as phone, email, address, and photo. To make it easy to have a photo associated with the employee, you can take a picture of them with your phone and then in the app open that employee record and click the Upload button next to the picture and browse to the photo on your phone. 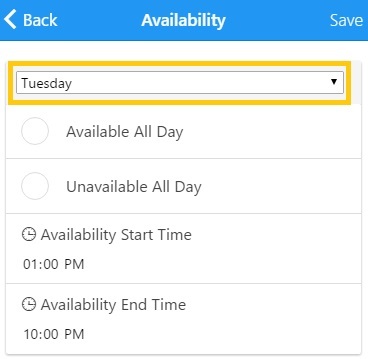 This first shows a summary view of availability for every day of the week. 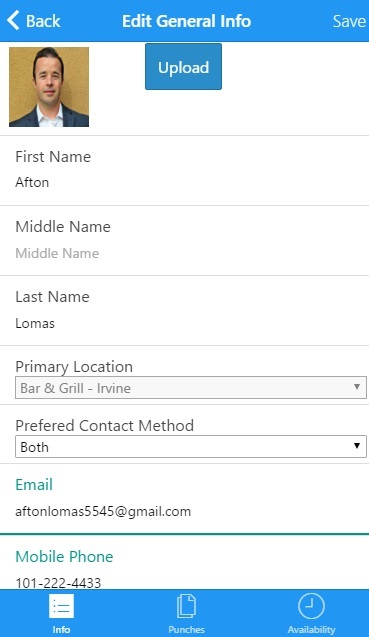 Click the Edit in the top right corner to change availability. This will open a screen where you manage 1 day at a time (screenshot below). It defaults to the first day of the week, but using the day dropdown at the top of the screen (orange box in image below) you can change to a different day of the week. Availability can be set as “Available All Day”, “Unavailable All Day”, or you can set specific availability start and end times. When finished setting that day, click Save in the upper right corner.